Undercover Black Man: Happy birthday, Fred Wesley. I’m jumping the gun with this. 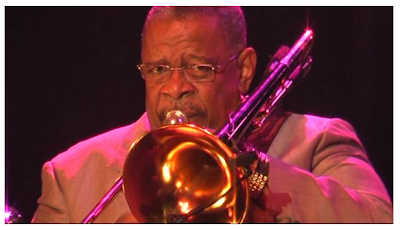 But tomorrow, on July 4th, trombonist extraordinaire Fred Wesley turns 66. There are three phases to Mr. Wesley’s wonderful career in music. In the early ’70s, he was James Brown’s bandleader and arranger. Mid to late ’70s, he led the horn section for Parliament and Bootsy’s Rubber Band. For the past 20 years or so, he has been a prolific solo artist, coming mainly out of a jazz bag. Naturally, I got plenty of Fred streaming on my Vox blog. Click here to hear “Breakin’ Bread,” off the 1974 J.B.’s album of the same name. Click here for Parliament’s “Getten’ to Know You” (1976). Wesley provided the explosive horn charts. Happy you are out of retirement for the near future. Just wanted to let you know how much I appreciate your Blog. I am approaching forty and for many years did not have a good way of keeping up with new music. I am happy to say that UBM has turned me on to lots of great music over the 8 months I have followed it.